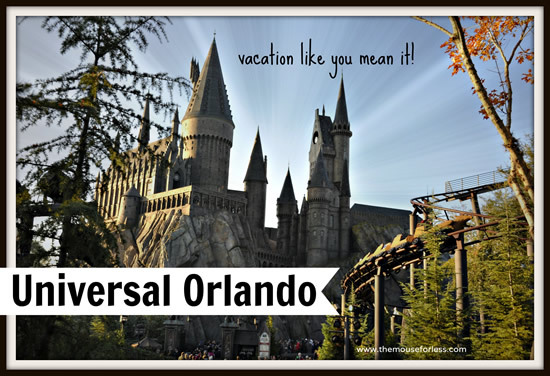 Universal Orlando Resort offers so much to explore when visiting Central Florida. The thrills and attractions at the two theme parks are not to be missed, especially after the addition of the Wizarding World of Harry Potter. The Wizarding World of Harry Potter is presented in two completely different sections in the two parks connected by the Hogwarts Express train. Diagon Alley is located in Universal Orlando and has The Knight Bus, Harry Potter and the Escape from Gringotts, Hogwarts Express – King’s Cross Station, Ollivander’s Wand Shop, Knockturn Alley, Leaky Cauldron and Florean Fortescue’s Ice-Cream Parlour. Hogsmeade, including Hogwarts Castle, is located at Islands of Adventure and has Hogwarts Express – Hogsmeade Station, Ollivanders Wand Shop, Flight of the Hippogriff, Harry Potter and the Forbidden Journey, Hog’s Head Pub and Three Broomsticks. In addition to the Wizarding World, though, the overall resort includes some amazing attractions at the theme parks. The theme parks are a great choice for thrill seekers as amazing roller coasters await. Universal Orlando is also the home to Marvel and super heroes such as Spider Man and the Hulk. Looking for great dining and entertainment? 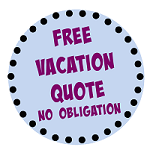 Look no further than Universal CityWalk. 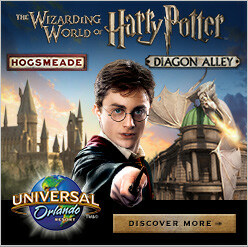 Universal Orlando offers guests four on-site resorts to choose from, each having unique themes and special benefits when staying at the Universal resorts and playing in the theme parks.